*Update - 9/2/13: Did you enjoy reading the Comic Conspiracy Comic Book Club selection X-Men: Second Coming? Four people voted, and the results are as follows: 8 Yes Vote, 3 No Votes, and 1 Vote for Indifferent. Thanks for voting. 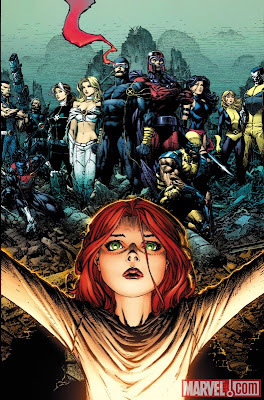 "The climax of four years of X-Men stories is the X-Event of 2010! What started in HOUSE OF M with the Decimation of mutantkind and erupted with the first new mutant birth in MESSIAH COMPLEX finishes here. In the epic crossover SECOND COMING, Cyclops' faith pays off when Cable returns to the present with Hope, the girl he believes to be the mutant messiah. But will she be the savior or destroyer of mutantkind? We may never know, as she is the target of an initiative for mutant eradication unlike anything the X-Men have ever experienced. Many will be wounded. Several will die. Is Hope worth it? Collects Second Coming: Prepare, X-Men: Second Coming #1-2, Uncanny X-Men #523-525, New Muntants #12-14, X-Men Legacy #235-237, and X-Force #26-28. " Bryce's selection for this month's Comic Conspiracy Comic Book Club is X-Men: Second Coming by Craig Kyle, Matt Fraction, Mike Carey, Zeb Wells, and Chris Yost, with art from Ibraim Roberson, Greg Land, Terry Dodson, and David Finch. I actually read this X-Men crossover when it was coming out, and yes that was at a time when I actually bought Marvel single issues. I enjoyed this series a lot as I was reading it; especially the build up books to this event: Messiah Complex, Messiah War, and the Cable and X-Force titles. Overall this was the peak for me with the X-Men titles and it really went down hill from here with most of the books, but I did really enjoy this title and I hope you listeners out there pick it up and give it a try too. We will discuss this title at length on Episode 121 of the Comic Conspiracy. This was a really cool end to a really cool event trilogy. I don't really like Bryce picking it over Messiah Complex/War but hopefully people will read those first before checking this out. Also too bad there are so many Marvel haters on Comic Conspiracy. I'm sure you will all hate it. I enjoyed Messiah Complex, Messiah War and Second Coming when they where coming out. I'm glad I get to revisit Second Coming, but yes, I do think Bryce should have started with Messiah Complex.